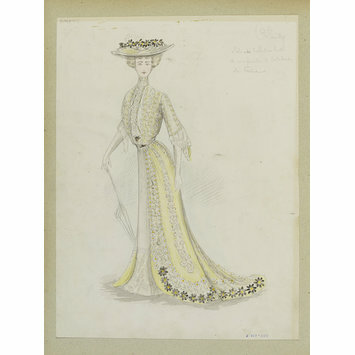 This is one of a group of 29 sketches for dresses bound in a volume entitled Été 1901 (Summer 1901) from the Paris fashion house of Paquin. Founded by Jeanne Paquin (1869-1936) in 1891, Paquin was one of the most successful couture establishments at the turn of the nineteenth and twentieth centuries. The 29 gowns in this volume were all designed specially for actresses and singers of the time, including Juanita de Frezia and Carolina Otero, stars of the Folies-Bergère; and the musical theatre star Jeanne Granier. This dress was designed for "Orlandy", the actress Suzanne Orlandi. Suzanne Orlandi is now mainly remembered for being one of the first women, in 1912-13, to wear one of her friend Gabrielle 'Coco' Chanel's little black dresses, a stark black velvet gown with a white petal collar. Chanel often criticised the elaborately constructed, tightly corseted, and luxuriously ornamented fashions of the early twentieth century. Her simple, easy-to-wear cardigan suits and dresses were created in reaction to the beautiful yet impractical designs that established couturiers such as Paquin presented. 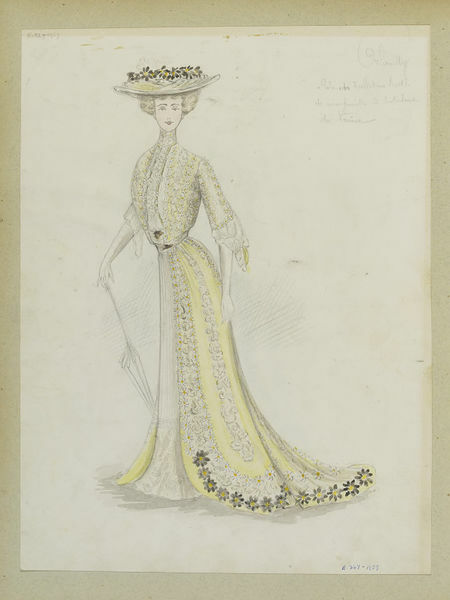 This sketch, of an yellow silk afternoon dress and matching hat, both lavishly trimmed with Venetian lace and masses of white and black artificial daisies, is an example of the luxurious fashions that so offended Chanel. Afternoon dress for Suzanne Orlandi. Pale yellow overskirt and bodice lavishly trimmed with Venetian lace and masses of white and black daisies, hat trimmed to match. One of a group of 29 fashion designs bound in a volume of Paquin designs for Summer 1901. Most in pencil with some ink and watercolour, some with names, details, and fabric swatches attached. Mme de Frezia was Juanita de Frezia, a performer at the Folies-Bergère whose career ran from the 1890s into the 1920s. She was featured on a 1899 poster for the Folies-Bergère drawn by 'Lem', and later appeared in silent films during the 1910s and 1920s, including Maud Jenkins(1912), La Femme Qui Assassina (1912), La prole (1921), La vivante épingle (1921), La joueuse d'orgue (1924) and Chouchou poids plume (1927). Yvonne Garrick was a young French comedy actress, born Marie-Berthe Yvonne Garrick, who made her acting debut in 1900. Her last performances appear to have been in 1921. Jeanne Granier (1852-1939) was a successful French musical theatre star and opera singer who made her debut in 1873, and enjoyed significant success during the 1880s-1900s. Manon Loti was an extremely beautiful opera singer and actress who was renowned for her elegance in early 20th century Paris. She enjoyed a certain notoriety, being reported in 1911 to have surrounded herself with deformed servants in order to emphasise her own good looks. 'Orlandy' (sic) was the actress and socialite Suzanne Orlandi, who is mainly remembered now for being one of the first women (in 1912-13) to wear one of her friend Coco Chanel's original "little black dresses". 'Otero' was Carolina Otero (1868-1965), also known as La Belle Otero. Whilst she was one of the star performers at the Folies-Bergère, Otero is best known as an extremely successful courtesan who counted Edward VII, Prince Albert I of Monaco, and royalty from Russia, Serbia and Spain amongst her conquests. Mme Terry was probably Ellen Terry (1847-1928), the most famous English actress of her day, who was renowned for her Shakespeare performances. - Daniel Milford-Cottam, March 2012. Jeanne Paquin. Été, 1901. Afternoon dress for Suzanne Orlandi. Pale yellow overskirt and bodice lavishly trimmed with Venetian lace and masses of white and black daisies, hat trimmed to match.